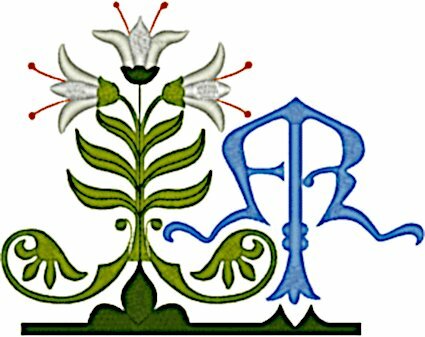 The white lily in this beautiful Marian border design represents purity of thought and action, chastity, and innocence and has been a symbol of the Virgin for centuries. This lovely design was created specifically for vestments and is from the Embroidery Pattern Catalogue, a publication offering iron-on embroidery transfers that was published in the mid to late 1800s by the Thomas Brown & Sons company of Manchester, England. Many of those traditional Christian patterns were hand drawn reproductions of designs from the 13th and 14th centuries. The sewn out size for the 5" x 7" hoop is 5.94" W x 4.68" H with 16,272 stitches. The sewn out size for the 6.25" x 10.25" hoop is 7.91" W x 6.22" H with 26,599 stitches. The sewn out size for the 7.75" x 11.75" hoop is 9.75" W x 7.66" H with 40,046 stitches.